In the heart of St Petersburg is an iconic street that was popular for artists, aristocrats, musicians and writers. RIR explores its history and legends. 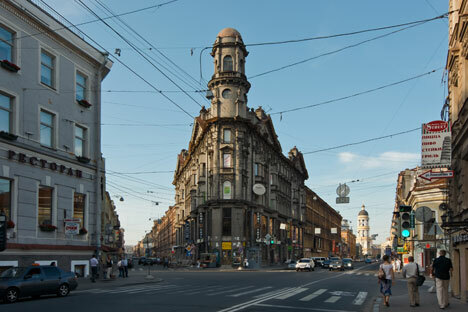 Rubinstein Street, off the famous Nevsky Prospekt, is located in the heart of St Petersburg. More than a century ago it was already a posh district, and home to Anton Rubinstein, composer and mentor to Tchaikovsky. In 1929, the street was named after Rubinstein, and it marked the cultural blossoming of this singular place, which attracted eccentrics as well as masters of word and song. The most notable building on Rubinstein Street is the “Tolstoy House,” a vast residential home with three inner yards, which was built in early 20th century and belonged to count Mikhail Tolstoy, Leo Tolstoy’s distant relative. Novelist Aleksander Kuprin went to a gym here. Grigoriy Rasputin also frequented this house – here, he visited secret meetings at the apartment of Prince Andronikov, who led a lavish and vicious life. Andronikov was eventually evicted by request of the owner’s widow, who was very unhappy with the shady characters visiting the prince. A prototype of one of Russian literature’s flamboyantly grim characters, Professor Voland (the Devil himself) from Mikhail Bulgakov’s “The Master and Margarita,” also lived in this house. When Bulgakov was in St. Petersburg, he used to stay in the apartment of Dmitry Pozdneev, a scholar and one of Bulgakov’s relatives. Pozdneev, a man with a remarkable personality, had a lot in common with his fictional characterization: Voland had “an empty left eye” just like Pozdneev, who wore a prosthetic glass eye; both of them were dark-haired, Orientalist professors of high stature and avid smokers with low voices. Pozdneev was executed during Stalin’s purge in 1937, while the image of Voland lives on forever in Bulgakov’s novel. Rubinstein 7, a bastion of Constructivism, commands attention on this street of gentle 19th century villas. Labeled the “House of Joy” by its founders, it was built in 1932 with the money collected by young writers and engineers, who were eager to experiment with a new communal coexistence. In the unusually small apartments, there were no kitchens and no bathrooms. The building, now re-planned, had communal showers and a canteen; there also was a kindergarten, library and a hairdresser – everything that could free young intellectuals from house chores. In the late 1930s, numerous tenants were jailed during Stalin’s repression and purges, including poet Olga Berggolts, who was accused of connections with enemies of the state. Two years after her return to the “city’s most awkward building”, as she put it, the Siege of Leningrad started. Berggolts, who lived in Leningrad through the whole siege, was the author of the line “Nobody is forgotten, nothing is forgotten,” which became the motto commemorating Soviet soldiers who perished during WWII. Among the dwellers of Rubinstein Street in the 1950s was Evgeny Rein, a poet and Joseph Brodsky’s senior friend. Rein first met Brodsky in the late 50s: “He visited me and read poems that I really liked. That’s how we became friends. Soon, I got a room on Rubinstein Street 19. Joseph was helping me move, carrying suitcases with books. We began to see each other daily, because he lived just three bus stops away,” Rein said. Rein, a socialite, was a friend to many Petersburg writers, including the great Sergei Dovlatov, who also lived on Rubinstein Street. As Rein recalls, “Sergei visited me almost daily. In slippers and a dressing gown even in nasty weather, he went out with his fox-terrier Glasha to get a beer and then appeared at my place, Glasha tucked under his arm.” Long talks about life and literature followed. Dovlatov lived at Rubinstein 23 until his emigration to the United States. Rein, Dovlatov and Brodsky all became famous worldwide, but in those times, they were just young writers reading to each other over a glass of wine. Today, in Dovlatov’s yard, a giant mural depicts an Underwood typewriter that became one of the symbols of Dovlatov’s prose; in his former room, the parquet still bears the stains that Dovlatov himself made, spilling his port – the current tenants are reluctant to remove those precious traces. Khil, who also lived in this house, was much more than just an Internet-celebrity. His outstanding career spanned 5 decades; he was known and beloved by everyone in the USSR. Khil was an outgoing person, who, as his son recalls, would chat with every admirer he met on the street. Khil was very energetic even as he aged. He worked in the concert administration office, which was located across the Fontanka River from his home. Both bridges crossing the river are quite far away from the Tolstoy house, so in winter the elderly singer would descend a rope ladder and cross the frozen river on foot. In the early 1980s, local residents noticed an increasing number of hairy rock pilgrims and amateur musicians invading the street – in 1981, the first Russian official rock club was opened at Rubinstein 13. At the time, it was the only place in Petersburg where young musicians could play rock legally – but only after a jury of Communist party officials approved their songs. The rock club helped launch careers of the bands like “Akvarium” and “Kino” – bands whose music Russia would listen to for decades to come.